As reported by W Magazine, earrings are 18 karat white/rose gold and contain 112 Asscher cut diamonds in a pale pink-brown color. Pink diamonds being some of the most expensive diamonds around – and red diamonds the most expensive of all – I can’t even speculate at the price. 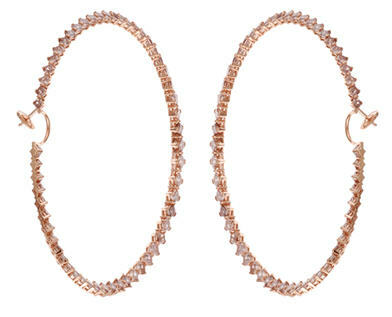 Since they were hand-delivered by a Chopard guard from their Geneva headquarters to the W Magazine shoot in Berlin. *Educational aside: Misspellings of the Asscher cut abound on the internet and in print. The cut is named for its originator, Joseph Asscher, whose Royal Asscher Diamond Company held the patent on the cut until World War II. Don’t forget the second (somewhat unfortunate) 'S' and that silent 'C' and you’ll prove your jewelry knowledge is a cut above the rest.